Shooting with Large Format is something that was bound to happen at some point and I’m very excited to announce that from this year onwards I will not only dedicate my blogs and tutorials to digital Black and White photography and digital post-processing for black and white, but also to analog photography, or more specifically: shooting with 4×5 large format cameras, developing 4×5 film sheets and the further processing of it via the digital darkroom. Large Format photography has always fascinated me, but until as recently as last year, this fascination has never resulted in actually considering the purchase of a large format camera and using it. As a photographer and educator of black and white fine-art photography, I also teach about the history of fine-art photography. This history of great fine-art photography was largely also the history of the large format camera. The iconic landscapes by Ansel Adams were shot with large format, the famous Pepper still life by Edward Weston, is shot with a large format camera. The iconic portraits from Irving Penn were large format, and it’s not difficult to find more examples in the history of photography. But it’s not only a medium from the past: also today large format photography is still in use by renowned fine-art photographers as their medium. Photographers like Edward Burtynsky and David Burdeny for example who have contributed significantly with their work to today’s appreciation of fine-art photography. Also in the camera industry, camera manufacturers like Linhof have never stopped producing large format cameras. 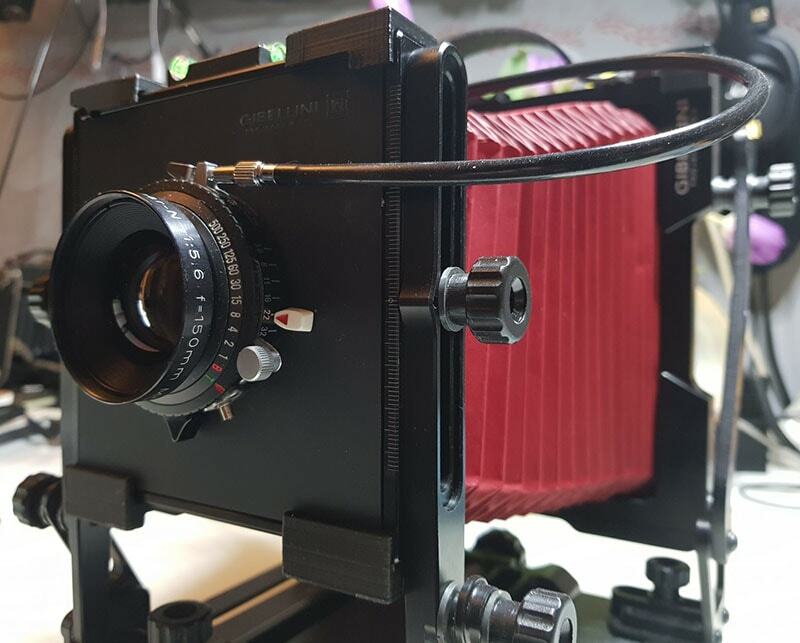 The 4×5 Linhof Master Technika for example is a classic that’s still being sold by B&H Photography. New ventures like Gibellini from Italy, have recently created a line of beautifully crafted, modern looking large format cameras. 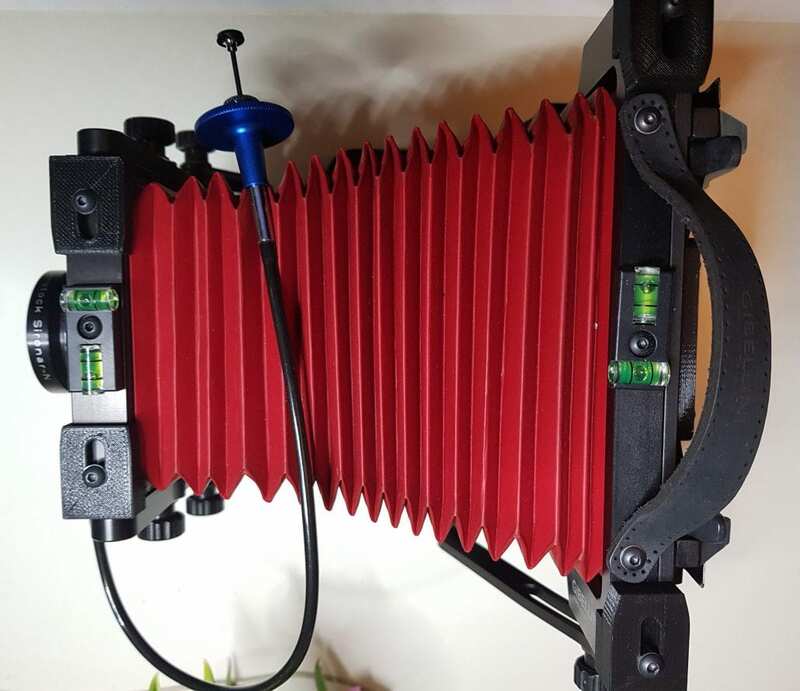 Another new venture, Intrepid from the UK, recently launched a very popular line of 4×5 and 8×10, very affordable large format cameras to accommodate the demand for more traditional ways of photography. A type of photography that shouldn’t be mistaken with outdated or archaic types of photography. Apart from that, there’s a beauty to large format photography, especially in my opinion, in portraiture and still life photography with results that are very hard to come close to with digital, even with digital medium format. As for myself, I’m using a 4×5 Gibellini camera with Schneider and Rodenstock large format lenses. You can get an impression by looking at the photos below. A look at the back of the 4×5 Gibellini with the ground glass while shooting architecture. The movements of a large format camera with rise, fall and shift movements that exceed the movements of a tilt-shift lens on a DSLR with a factor 4, are ideal for architecture, giving even more flexibility and unusual and more dynamic angles than with a DSLR. One of the reasons to shoot large format. This is what you see through the ground glass when composing for a shot. The image is upside down and rather dark around the edges as I’m not using a Fresnel lens, yet. Zooming in is usually done with a magnifier. Composing upside down is not as hard as it may seem at first sight. You easily get used to it. 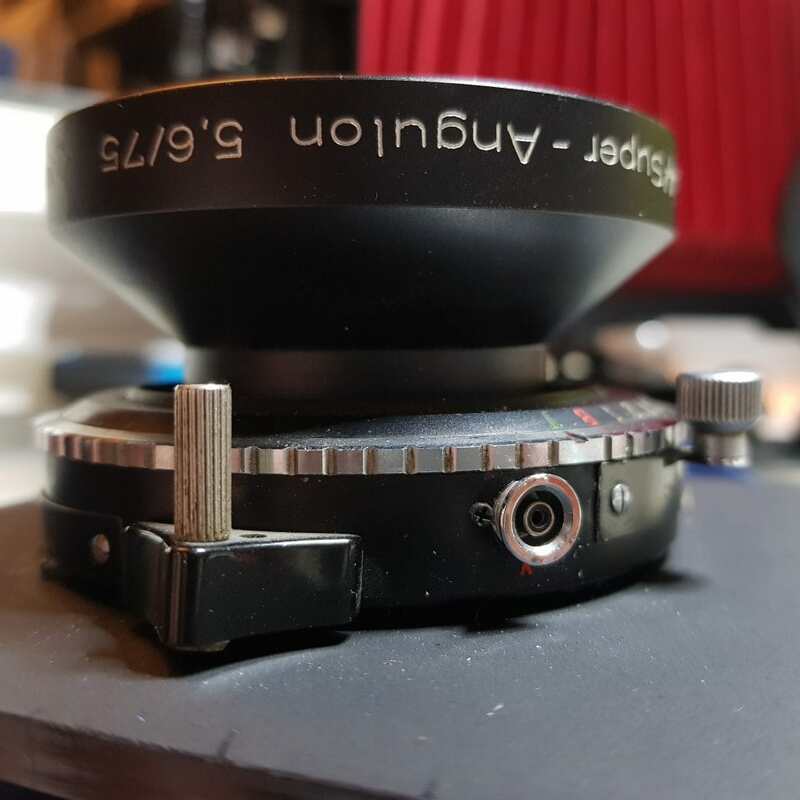 A 75mm lens for the large format attached to a lens board that’s specific for the camera. A 75mm lens in 4X5 large format photography is considered a wide-angle lens, comparable with a 25mm lens for a full frame DSLR. The bellows are a typical feature for the large format camera, that enables the photographer to focus the lens, and do movements such as rise, fall, swing and tilt. Another typical feature is the lens with Copal shutter. The shutter is released/closed by a mechanical cable release attached to the lens. In the weeks, months, and hopefully years to come I will increasingly publish articles on large format photography. 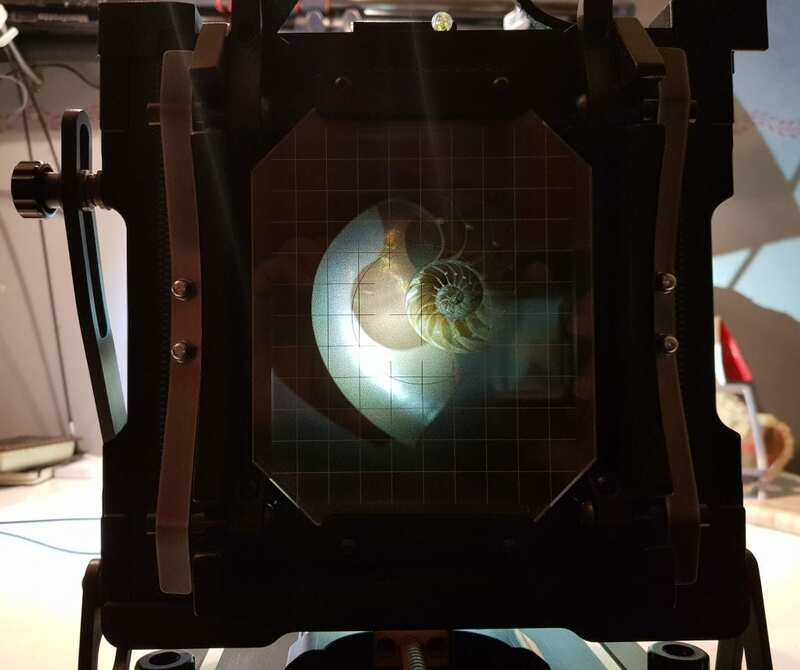 From the type and choice of large format cameras to large format lenses, the specific use of large format cameras and its unique movements, developing negatives and the use of specific chemicals, scanning for digital post processing to the actual digital post-processing itself. The latter will overlap largely with post-processing of native digital images on my website. It should be clear from this that I’m trying to advocate a hybrid workflow: analog, from the capture to developing negatives, and digital, from the scanning to the final result in the digital darkroom. It’s a very conscious and deliberate choice that I will discuss in the upcoming articles. Basically, the reader should be able to make an informed decision to also seriously consider large format photography and where and how to start, and of course how to actually shoot with it, should the reader be interested. And else, it should be an educational and perhaps entertaining read for all of those who are genuinely interested in photography in all its forms but prefer to shoot digital. What I’m certainly not trying to do is to advocate large format or analog photography in general, as the medium of choice for ‘serious’ or ‘real’ photographers. It is a kind of elitist thinking that I like to distance myself from. It is not a matter of better or larger, it is pure fascination and passion that drives me to also do large format photography. It’s the insatiable drive for variation, exploration and experimentation that makes me do large format photography. I still love doing, and I will keep on doing, digital photography with DSLR’s and with Medium Format cameras like Phase One. And certainly I will do a side-by-side test of large format with digital medium format and DSLR. It serves no other purpose than to compare what the real differences are and to get an impression of how they relate to each other as a medium for fine-art photography. 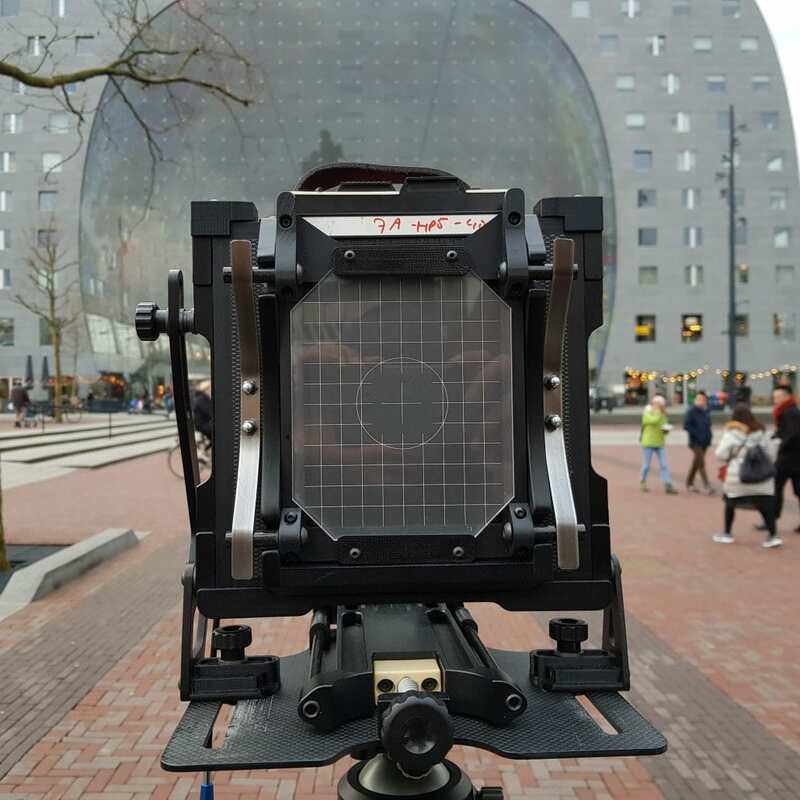 Henk Bijl, another large format photographer with whom I frequently shoot, will also publish his own experiences with large format photography, and his Linhof Technika 4X5 camera in blogs on his own website. Some Youtube videos to accompany the articles are also in the planning. With the articles and tutorials to come, I hope to contribute in a way that will also appeal to black and white analog photographers, but more than that, I hope to broaden the scope of digital photographers and perhaps entice that group to pick up an analog camera. Because it is quite fun! On a side-note: I’ve just released a brand new panel, B&W Artisan Pro, for advanced and accurate editing of black and white photographs in an easy, intuitive and fast way, using unusual non-destructive and innovative techniques that I’ve developed myself. Have a look at the panel here. Existing customers should have received an email offering a higher discount than for non-customers. Please inform me if you haven’t received such an email. Hi Joel. I love the large format “look”. When I attended photography school back in the late 70s that is all we used. 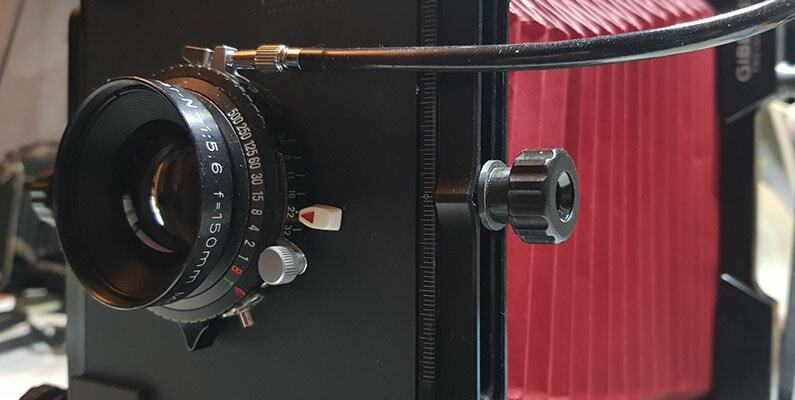 I recently purchased a Horseman 4×5 with several wonderful lenses included at a ridiculously low price. I love architecture as well as very classic portraiture. I am specializing in large format Black & White portraiture in the style of one of my favorite painters, John Singer Sargent. I went digital in 2005 but was never quite happy with the “look” I longed for. Going back to film has quenched that thirst. Looking forward to learning more. Enjoy your fascinating images. Thanks Peter, I’m actually working on a new video tutorial (paid tutorial) for the latest version of my B&W workflow and it will most likely include a section on scanning negatives and how to treat it further in the digital workflow. They’re going to be a 2 or 3-part video bundle that you can also buy separately. 1 video will be all about the digital B&W editing techniques and how to create ‘good’B&W photos. Video 2 will be on digital masking techniques, and what the best way of masking is. One of those techniques is a technique I’ve developed and you can’t find anywhere else. And video 3 will be on preparing analog film for the digital workflow as described in video 1. Thanks a lot for sharing your thoughts! People like you keep the craft and art of film photography going! Tom, I get it when you say you’re intimidated by film. Because analog photographers often speak in a language that is different from digital photographers. With my new blogposts I’m trying to remove the language barrier and hopefully make film feel less intimidating. Thanks for taking the time to read. I would like to try large format photography for landscape work. The cost of importing those cameras into India, sadly, will be very high! I don’t know the situation in India, but know that there are also very cheap options these days. Still importing can be very costly depending on the additional customs fees. I took up large format last year. I use a Chamonix 45H-1. I haven’t given up my digital, this is just another medium for me that offers different esthetics, etc that digital doesn’t have. Was thinking how this would do with architecture/fine art bw. I will be interested in how you create your b/w. Will you create it from color negatives or slide film or use bw film with the appropriate filter/s. Glad to see I am not the only one moving to or back to film. Thanks Steven and I agree, it’s a different kind of aesthetics compared to digital, and that was one important reason for me to shoot large format. I have several architectural LF shots and the amount of detail is quite overwhelming. So much so I tend to ‘soften’ the photo a bit. Depends on the type of film too of course. For now I’m creating BW from BW film but of course I’m also going to shoot color and then convert it, but perhaps I’m leaving some of them in color. My heart jumped high seeing that you’ve started the 4×5 experiment. I’m curious to learn more of your experience. I’m very inspired by your book “From Basics to Fine Art” and as I am a pensionated amateur (in Utrecht) I wonder if I could use your ArtisanPro with Lightroom. Probably it stays to be a dream. Nevertheless I gently follow your developments and try to get out in the upcoming warm period. Many thanks Zip, I’m happy to hear that my 4×5 endeavours are being welcomed. Also very happy to hear you’re being inspired by our book! I just took a look at your Flickr photostream and I love what I saw. The first photo you’ve posted is quite something. Unfortunately the Artisan Pro panel cannot be used with Lightroom, only with PS CC2015.5 and higher. Hartelijke groeten terug! Very interesting move, and one which should open up new creative possibilities! I look forward to following you on your journey. Thanks Rick, there are many new creative possibilities with LF that I’m really enjoying right now.